I live in a riverside flat with my husband Richard, an English graphic designer and author of non-fiction books. The flat is in Battersea, southwest London, about a half hour’s walk from the Kings Road in Chelsea or leafy Wandsworth Park in Putney. As an American, I never feel a stranger or out of place because London is so cosmopolitan. Richard and I have just had a purge of about three hundred books but there are still thousands left. This section in my study (the second bedroom) is about a hundredth of the total number. When we moved in twelve years ago we had a carpenter put in an entire wall of bookshelves in our bedroom and also in our big living room. There are even books in the hallway, stacked against the walls. 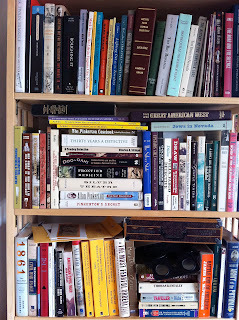 This picture shows part of my Western Mysteries research shelf. The top shelf holds books about Mark Twain and his time in Virginia City as a reporter. I also have books on the history of that town and the area around it, called The Comstock. century Rome, I can listen to 19th century music! Below my box set of DVDs for the entire 1960s series of The Wild, Wild West you can see my stereoscopic viewers. 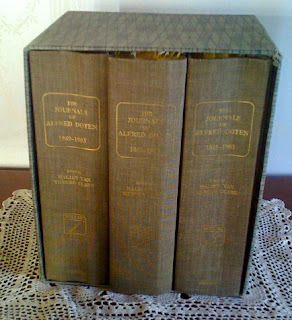 My books are set at a time when the first 3-D photos were in vogue. Using those viewers with stereoscopic photos, I virtually look into the past. 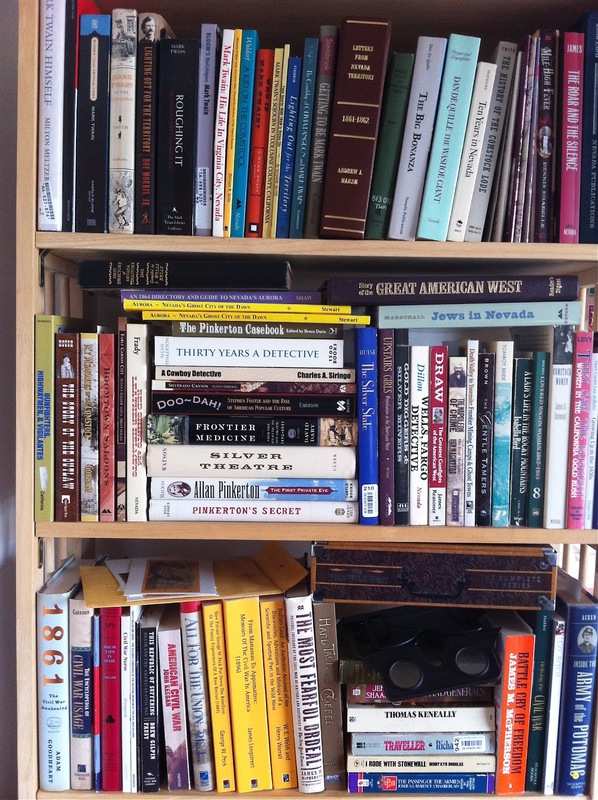 Out of sight on the shelf below is Flederman’s gun catalogue and other catalogues from the American Victorian period, plus big picture books about guns, Native Americans and early photography. One of my motives in writing a series set in 19th century America was to learn more about my own history and background. My husband Richard has always been a Civil War enthusiast and for the past five years I’ve been sharing that passion with him. Another delight of researching this period is delving into the thousands of intimate letters and journals written by people. My “Bible” (apart from the King James version) are the diaries of Alf Doten, a massive three volume record of one man’s life, kept from the age of 19 until his death fifty odd years later. It lives on my desk by my computer. What you can’t see here are all the documents I have in box files and folders: newspaper articles, travel brochures, museum guides and re-enactment programmes. Nor can you see the fabulous resources I have access to over the internet: thousands of Mark Twain’s letters, for example, or scans of Lady’s Magazines, just to name a few. And you can’t see my Kindle, where I have just downloaded Team of Rivals: a biography of Abraham Lincoln by Doris Kearns Goodwin, and a 900+ page document on my iPhone! And then there are the DVDs like the film Gettysburg or Ken Burns’ fabulous documentary about the American Civil War… But I am getting away from the main topic: books! Caroline Lawrence’s latest history mystery book, The Case of the Good-looking Corpse is set in Virginia City in the 1860s and includes shootouts, firemen, lawmen, journalists, music by Stephen Foster, Mark Twain and ‘soiled Doves’.